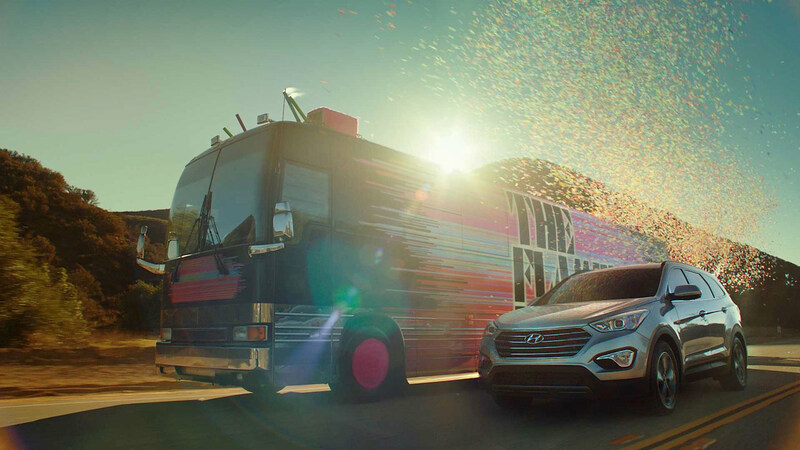 Working with the team at Innocean, director Jody Hill and The Mill LA, Hyundai brings you the best. playdate. ever. "I had a great time working on this project," shares VFX Supervisor and Lead Flame, Tara Demarco. "The shoot went really well. All of the talent was excited to be part of the process and the band was willing to do anything asked of them to make the spot better. Wayne Coyne from The Flaming Lips actually practiced that blueberry catch for hours with popcorn before trying it on camera…he was surprisingly good at it." Aside from perfect Blueberry catches, a lot of went into planning this playdate. "We worked on two kinds of visual effects for this commercial," explains Tara. "The first kind is your basic rig-removal and cleanup. We had rigs for the band on the roof and our upside down yoga boy. We removed the reflections of the camera car from the sunglasses of the family and stitched together plates of the family and the ostrich." The second layer of effects were a bit more theatrical. "We got to animate the face of the sabretooth tiger and add some 3D confetti to the in-camera confetti cannon on the tour bus," describes Tara. Because what's an epic playdate without a sabertooth tiger and confetti cannon?